On the morning of day six we drove two hours to see the Kara tribe who are known for their beautiful body-painting. We stopped along the way to watch some Hamer people laboriously dig a well in another dry river bed. I’m sure the folks digging that well would welcome development that brought them fresh clean water. Later we made stops to photograph huge termite mounds and the gorgeous “rose of the desert,” that is not a rose but looks like a combination cactus and flowering tree and is neither. We later passed by large fields of industrially grown cotton planted by a Turkish company. The first Kara village we stopped at overlooked the Omo River. The people there practice flood-retreat agriculture. That is, they plant their crops of sorghum, corn and beans on the banks of the river right after the annual flood. The damming of the Omo will put an end to this type of traditional agriculture. The cultural impact is even greater than the building of the dams and reservoirs by the Tennessee Valley Authority in the US in the 1930’s. 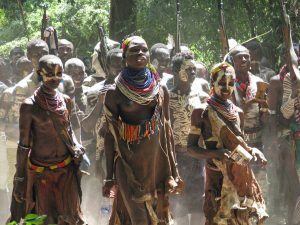 It is unclear what the central government will do to compensate the tribes, but it will have to do something because keeping at least a semblance of tribal traditions is key to its plans to develop tourism. We were scheduled for another photo shoot at a second Kara village further south. At this village we would not have to pay 5 birr per shot because the assistant head of Omo Child is from there and the villagers are grateful to Omo Child for stopping Mingi killings. After the shoot, we were treated to a fabulous performance of the “frog” dance, a courtship opportunity. Men and women in these communities lead very separate lives and these types of community dances give them a chance to interact and flirt. The dancers form a circle with the men on one half and the women on the other. Accompanied by a cappella singing, the women gracefully advance a few at a time over to the men who are jumping as high as they can. Couples momentarily pair off and then part. The men periodically work themselves up to a group crescendo and the cycle starts again. We were all invited to join the performance at the end. I am really self-conscious when this kind of moment occurs and step aside if I can. I need to get over that shyness because I’m missing out on some really fine opportunities to interact with folks. We had a long dusty ride back to Turmi where I was promised we would visit a local handicraft market. It was late in the afternoon when we pulled up into the center of town where the market was supposed to be, but there were only a couple of vendors left. I was really pissed because Chris and J.D. had been telling me not to buy in the villages and that we would do better at this market. Except for a few lip plates, I had been restraining myself. Almost before we were able to get out of the vehicles, lo and behold, a dozen or more vendors appeared, threw their blankets on the ground and started arranging their wares. I had never seen anything quite like it. It turns out someone had spread the false rumor that the “taxman” was coming around and most everyone had split. But when our 7 vehicles loaded with tourists showed up, the market miraculously manifested itself. As is usual in these situations, a teenage boy who spoke English claimed me as his client and followed me around translating the bargaining. He reminded me of my son Moran and his friend Brendon when they were in high school. They were always looking for an opportunity to make a little money and would certainly not be above hustling a couple of strangers. I found him actually quite helpful and he only cost me 30 birr ($1.50) in the end. I would have given him more but that’s what he asked for. 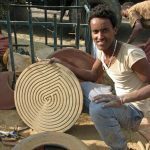 Handicrafts in Ethiopia are really a steal. Tourism in the Omo Valley has not developed to the point where there are souvenir shops selling cheap imports from China. The vendors at the Turmi market were selling basically the same things that the tribes make for their own use. 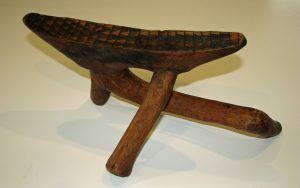 I was able to purchase a goat skin “skirt” that a Hamer child would wear, a cool inscribed calabash decorated with cowry shells, a Hamer first wife necklace and a really great Kara stool for about 600 birr ($30US). Of course, you have to bargain. 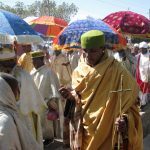 The same would hold true even in Lalibela up north where there is a lot more tourism. As we were leaving, I glanced out the rearview mirror and the market had already disappeared. I returned to the Buska Lodge at peace. This was a day to savor. Early the next morning we drove south once more, this time near the borders with Kenya and Sudan. 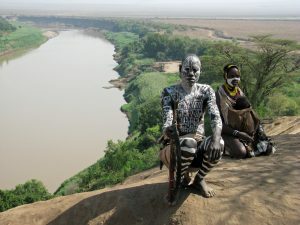 We were scheduled to visit the Dasanech people on the other side of the Omo River. 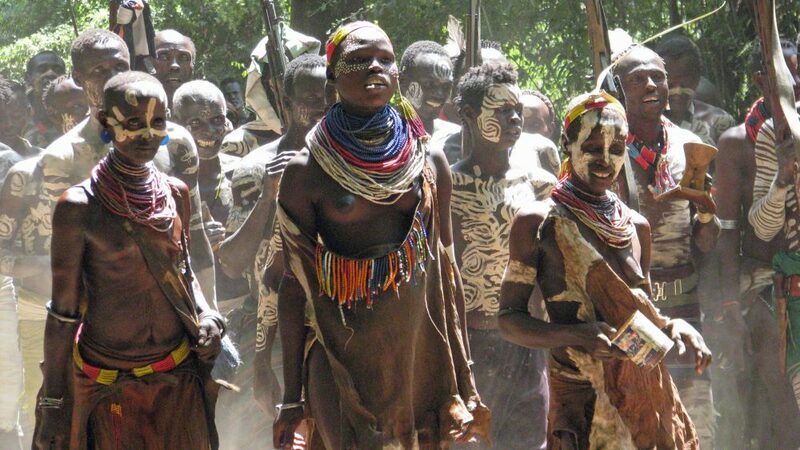 The Dasanech are the most southern tribe in the Omo Valley and number roughly 65,000. Unlike most of the tribes, they have taken in a number of different groups over time. 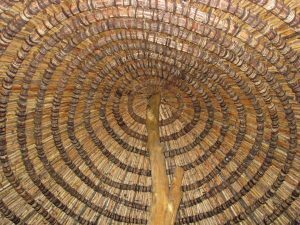 They are divided into 8 clans and each clan makes its special contribution to the tribe as a whole, i.e., one clan is good at treating diseases, another is skillful at fishing and hunting crocodiles, and so on. Members of the same clan cannot marry or even dance with each other. We crossed the river in dugout canoes. I noticed a school in the village but I was told it was only for the boys. We were treated to a dance performance, but it lacked the inclusiveness we experienced the day before at the second Kara village. As usual, a couple of small boys tagged along with us. When I paid one wearing a long shirt to take his picture, I gestured to him to put the money in his pocket. He didn’t seem to understand what I was getting at, so I kept putting my hand in my pocket. That’s when he raised his shirt to repeat my gesture and I realized he wasn’t wearing any pants. Back in Turmi our hosts had arranged for us to see a cow bleeding in the Hamer village near the Buska Lodge. 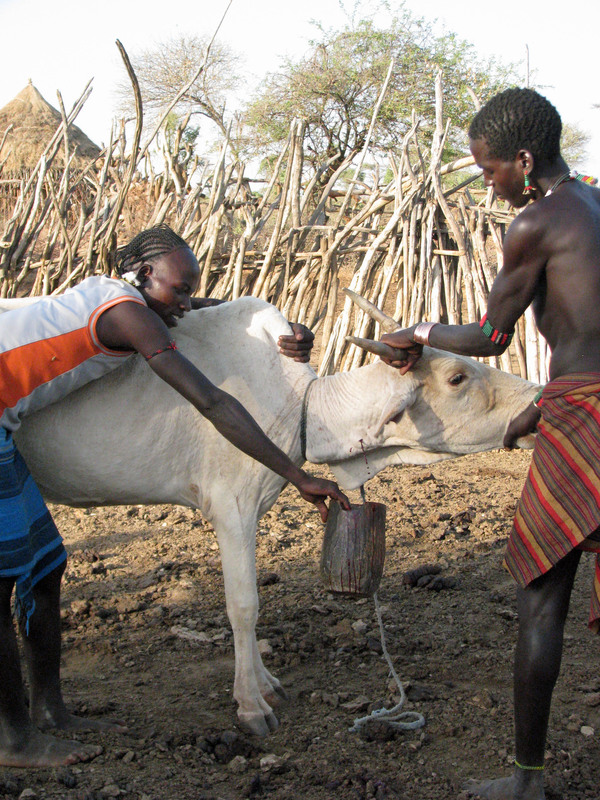 Cow bleeding is quite common among the Omo Valley tribes. Some rely on it for food more than others. The Hamer drink cow’s blood mainly to recover from an illness or some other physically draining event like child birth. However, the Mursi regularly use cow’s blood and milk to supplement their largely sorghum and corn diet. The cow’s neck is tied with a tourniquet and then the animal is shot with an arrow in the neck where there is a good vein. The blood is caught in a calabash and briskly stirred until the blood gels. Then it is eaten and the cow released to recover from its wound. After the cow-bleeding, Noel and I went off to explore the village. We met again many of the folks who had been in the Hamer photo shoot in the dry riverbed two days before, including a sweet young boy who spoke really good English and who was about the age of our younger grandson Parker and just as precocious. Once again we were also taken up by a teenage boy who acted as a translator between us and a Hamer woman who was selling handicrafts. Our smaller friend took me aside to tell me, “Don’t give him any money because he’ll just go to town, buy beer and get into a fight.” He had clearly overheard his elders saying that. I tried to explain to him that that’s what teenage boys do, but hopefully, they see the error of their ways as they grow up and most do. 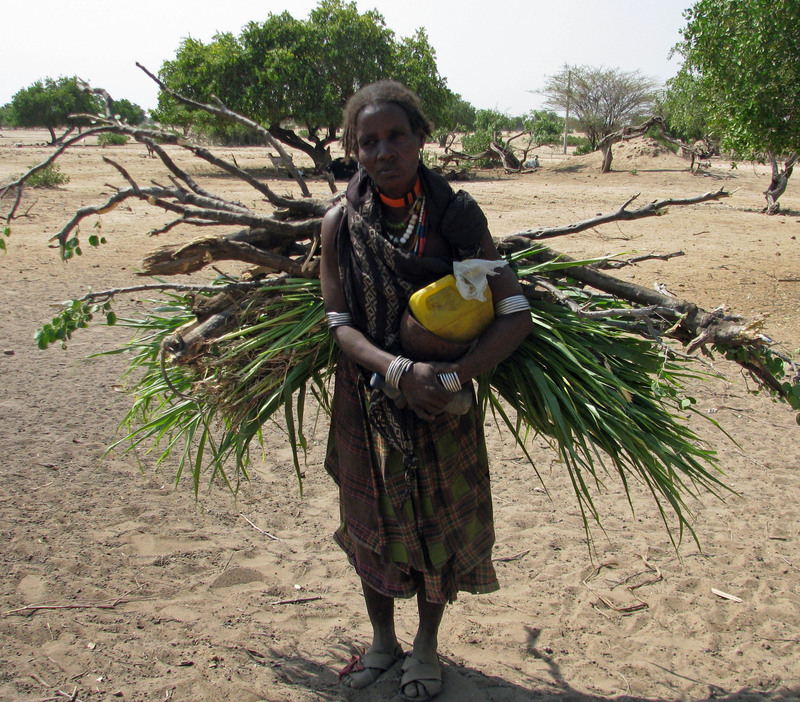 We headed back up north the next morning, stopping at an Arbore village on our way. 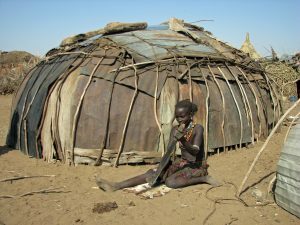 The Arbore are another small tribe of around 6,000 and seem to live pretty much at peace with their neighbors, unlike more aggressive tribes like the Mursi. They are known for sharing their resources and intermarrying with other groups. It seemed to me that the men and women mixed more and there was a general sweetness about their demeanor. All of the tribes that we visited adorned themselves with beautiful beadwork. 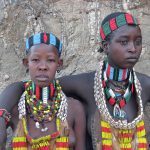 I noticed a few of the Arbore men wearing metal watch bands incorporated into beaded necklaces. We did witness one negative incident. A German tourist took it upon himself to throw down candy for the children in lieu of paying the 5 birr for photographs. The Mursi wouldn’t have let him get away with that transgression. They would have confiscated his camera and sold it back to him piece by piece. Our next destination was the Kanta Lodge near the stone walled village of Gamole where the Konso people live. The Kanta Lodge is a beautiful facility with individual tukuls set in a lovely garden. 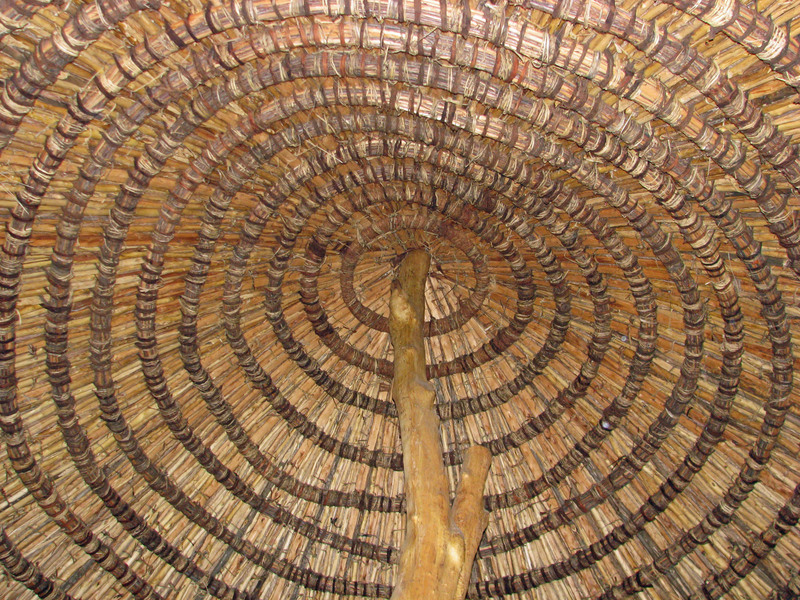 The tukuls are elegantly simple with the most wonderful thatched roofs. The lodge’s kitchen served the best food we had in the Omo Valley. 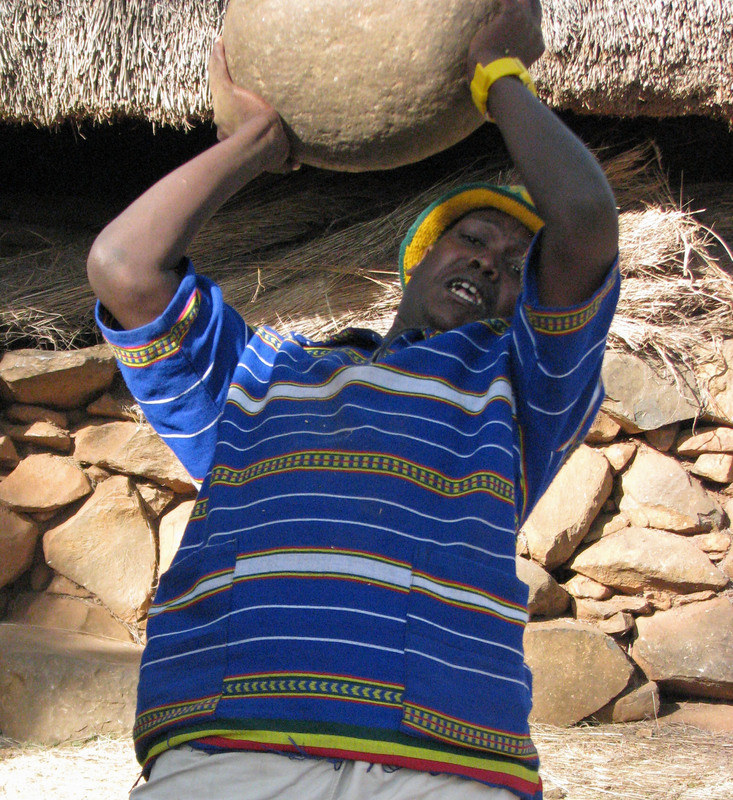 Gamole is one of 11 Konso villages, or really towns, declared UNESCO World Heritage Sites by the United Nations. About 5,000 people live there and it is constructed as a series of stone walls built in circles, one wall surrounding another. The land around the village is densely terraced. Unlike their neighbors to the south, the Konso are not nomadic pastoralists. They are basically farmers who built their stone towns as defensive measures against their aggressive neighbors. The Ethiopian time machine had advanced us 1000 years ahead of the tribal people to the south. 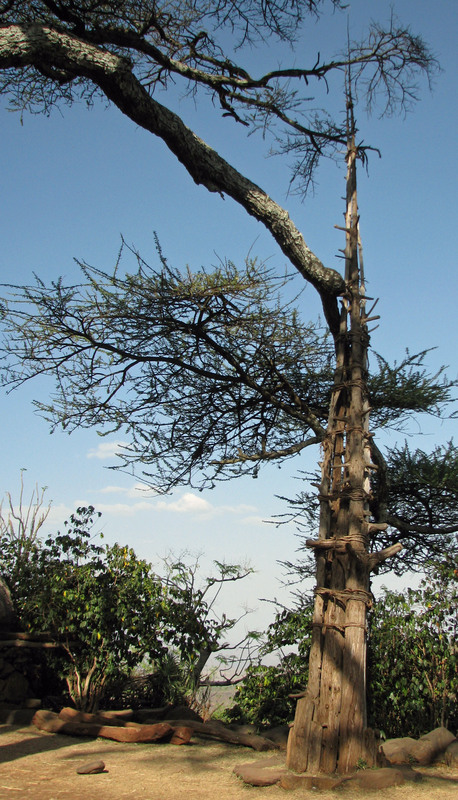 The Konso are known for the wagas or wooden statues erected to honor dead heroes. They also erect “generation poles” every 18 years to designate the start of a new generation. You can tell how old a village is by the number of poles inside it. They also have the interesting custom of building a communal house for adolescent boys in the community. The boys sleep there and do community service work. When they reach marriageable age, they have to toss a 40 kilo stone over their shoulder a certain number of times before they are allowed to take a wife. Walking through the village was like meandering through a stone labyrinth. From time to time we would come upon a village square where folks can sit and gather and where the generation poles are placed. The village also has a “swearing stone” that serves as a kind of Konso bible for testifying in disputes. Gamole was the only place where children were not hassling us for money. Apparently, an edict has been issued, probably by the Konso king, that children are not allowed to take money from strangers. 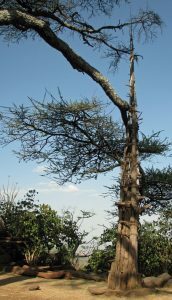 We paid a brief visit to Kala (Chief) Gezahegne of the Konso who lives nearby in a beautiful stone-walled compound with thatched roofs next to what the Konso have designated a sacred forest. The Kala speaks excellent English and is appropriately enough a civil engineer. During a brief question and answer period he expressed his concern about preserving the natural environment and balancing tradition with modern technology. The tension between conservation and change was the theme of our week in the Omo Valley. 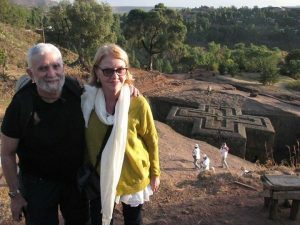 The next day we flew back to Addis Ababa to prepare for our journey north to Lalibela. We were treated that evening to a terrific lecture and slide show on evolution and the natural and cultural diversity of Ethiopia by Dr. Berhane Asfaw, an Ethiopian paleontologist. I wish a few of our less enlightened American politicians had been there. This site is based on some of my travels with my husband Noel and grew out of the newsletter I published periodically to promote my gallery, Ridge Art. I had a 25+ year career in advertising and print production before opening the gallery in Oak Park, Illinois, in 1998. It featured Haitian art and other work by self-taught and visionary artists from around the world. I closed the physical gallery in 2010 to focus on my growing internet business. In August 2017 I closed down the gallery website ridgeart.com and created the website ridgearttravels.com. Ridge Art Travels is not a commercial site and does not accept paid compensation from any of the hotels, travel agencies, restaurants, etc. mentioned in any of the essays. Copyright 2017 Laurie Beasley. Site designed by Nicole Sankowski.